Our boat Chipper’s Clipper is a top rated deep sea charter fishing vessel with home port at Orange Beach Marina in Orange Beach, Alabama. We’re experienced charter operators trolling and bottom fishing some of the best sportfishing waters in the Gulf of Mexico. 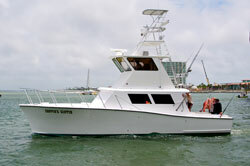 The U.S. Coast Guard licensed charter boat Chipper’s Clipper is a 42-foot Sportfisher which comfortably carries 1 to 6 passengers for offshore deep sea fishing trips of 4, 6, 10 and 12 hour charters. 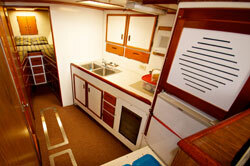 Chipper’s Clipper features a luxurious cabin, full kitchen, sleeping areas and sparkling bathroom facilities. 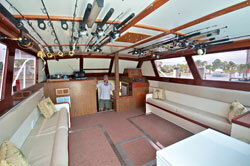 All tackle and bait is included in your charter, along with ice to keep your catch fresh right to the dock. Learn more about our “hook and cook” recommendations to enjoy your mouth watering catch cooked to order as fresh as can be right after you dock (CLICK HERE). You can learn more about some of the species we catch on Chipper’s Clipper, along with their respective seasonality HERE. Meet your Captain and Crew HERE — they have 30 years of experience providing the finest deep sea fishing and sportfishing charter experience you can find on the Gulf of Mexico. *Prices are for up to six people. 1 to 6 passenger trips by private charter only. Tip amount for deck hands of 15-20% of total charter amount is suggested. Professional fish cleaning also available for $.30 per pound.